One of the key topics was rising crime. There is no doubt it is on the up – you need only look at the crime mapping on this site to see that recent months have seen an increase, especially in burglaries. This presents two challenges. How do you tackle the rise in crime, and how do you communicate it without creating a disproportionate fear of crime? I had always been a ‘fear of crime’ sceptic, thinking the real issue is not fear of crime, but crime itself – that if crime itself was tackled successfully then the fear would dissipate. I was wrong. Fear of crime is a major issue. People can spend their entire lives fearing crime, even letting it change their behaviour, despite there being a good chance they would never be a victim. Ironically, things you might anticipate would reduce fear of crime actually increase them. For example, people in high crime areas often fear crime the least, because they become desensitised and realise that, while not pleasant, most crime will not place them in physical danger. And fear of crime doesn’t just have personal effects. From the takings in a shop to the use of community facilities, when people fear crime their behaviour changes and that impacts on those around them. A key message I always try and get out is that Wandsworth is the safest inner London borough. The past few years in particular have seen rates of crime in Wandsworth fall to incredibly low levels. Wandsworth is still the safest inner London borough, but realistically we cannot expect the rates of crime to remain at those very low levels during recession. And the recession is a major driver. A few months ago I met a borough commander from the north of England and discussion turned to the effects of the recession. He was seeing a rise in crime and also a change in patterns, some of which we have seen here, for example an increase in robberies and thefts of cash (rather than items that still need to be sold on). And some we have not, such as an increase in the theft of necessities rather than luxuries (they identified one suspect because he’d help himself to nappies for his newborn child when he was robbing a store). But while we need to be open and honest about the rise of crime we also need to keep the perspective that Wandsworth is still a very safe borough. For example, my latest crime map includes 92 crimes. While this may seem a lot for a population of over 280,000, it’s still a fairly low rate – about one crime per week for every 3,000 people. If I were to offer you odds of 3,000 to 1 on an event, you probably wouldn’t think twice before saying no. Yet there are a lot of people whose quality of life suffers because they think the odds are much much lower. 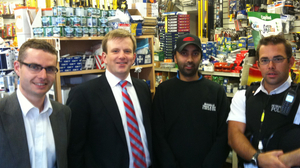 And this brings me to my little walkabout in Tooting with Timothy Watford from the new town centre team (in the picture with Nick, me and Bob Singh from Russell’s DIY). I believe Tooting is one of those places that people have a disproportionate fear of crime – it sometimes seems there’s an assumption that Tooting has the borough’s highest crime (actually, it has less than the borough average). One of the biggest problems in Tooting is overcoming these negative perceptions. That’s why initiatives like Tooting Together are so important. For example, it’s amazing how much cleaner the streets look because of time-banded waste collection and the council taking responsibility for pavement enforcement from TfL. Whether you believe in the broken window theory or not most will agree they feel a lot better about a place when it’s clean and doesn’t have bags of rubbish from various shops scattered all over. And often solutions lie within communities, and not with police or council enforcement. Russell’s DIY, along with lots of their neighbours have signed up to AlertBox, a fairly simple system which allows the businesses to warn each other if they see something they consider suspicious or call for help if they need it. So far there’s only been one use, which was accidental, but resulted in several people immediately gathering to offer assistance – but the key is not so much that it’s there, but that businesses feel safer, largely because they are part of a directly linked community looking out for each other. I think there’s a huge amount to be positive about in Tooting (and not just from the community safety perspective) with schemes like AlertBox and the Good Neighbour scheme within the community, along with the work the police and council are doing there. And a lot to learn and apply in the rest of the borough.